19 photos A polished transitional kitchen with raw, natural edges creates just the right amount of drama. The key is to practice restraint to achieve the perfect balance between the masculine and feminine. It’s rustic, while still completely refined. 29 photos When this young couple bought their dream home, their dream kitchen seemed completely out of reach. 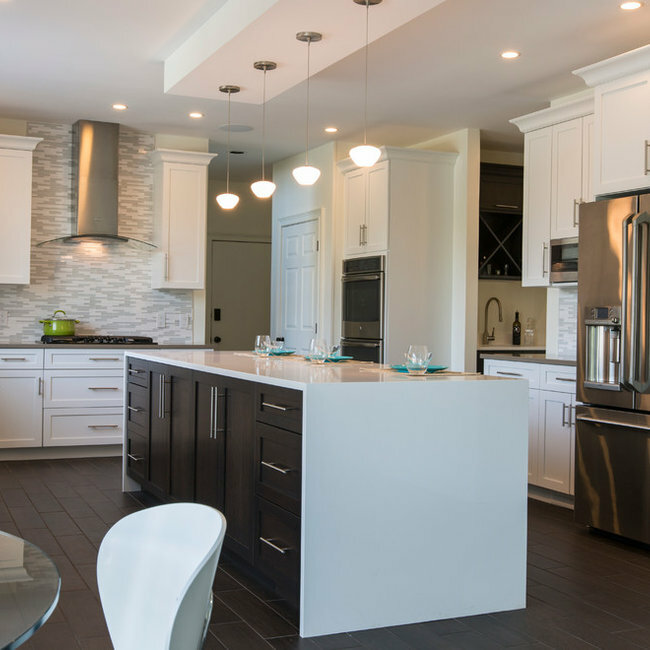 With only minor updates to the floor plan but major updates to the finishes, the kitchen was transformed into a sleek and modern space that the whole family could enjoy. High contrast finishes feel crisp and fresh, uncluttered and composed, creating calmness and ease for an otherwise busy family. 15 photos Entirely rustic and yet entirely refined, this kitchen remodel makes a grand statement. Dual-finished cabinetry and a unique backsplash combine for true wow-factor. Even the living room fireplace received coordinating built-ins to complete the look. 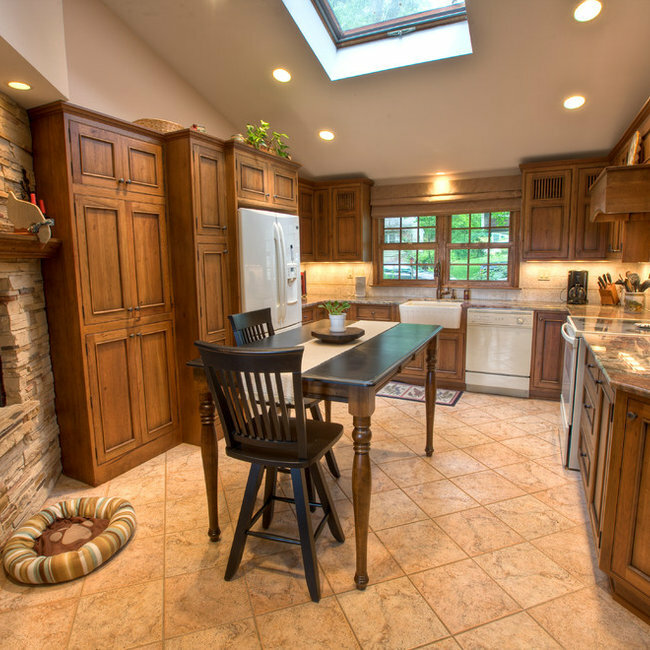 14 photos A major kitchen face-lift makes an impression with a traditional aesthetic and touches of craftsman influence. Mixing slate and glass in the backsplash, polished and leathered finishes on the countertops and balancing the earthy elements with a sophisticated tradition creates a warm and inviting space. 9 photos This small space received quite the transformation when our design team opened up the wall separating the dining area from the kitchen. Making room for a peninsula with seating makes the formerly closed-off space much more inviting. The finishes are primarily neutral but not lacking in interest as little flecks of copper can be found in the quartz countertops and backsplash. The kitchen is now the gorgeous centerpiece of the home. 16 photos Quartersawn oak cabinets and a soft green backsplash reflect the woods outside the kitchen window. Meanwhile, the craftsman details evoke a casual simplicity. The hardware is a hammered; the granite is softly mottled and the stained glass light fixture brings in color and interest. Each individual element of the room is beautiful on its own, but the combination creates a warm and inviting atmosphere that is both refined and comfortable. 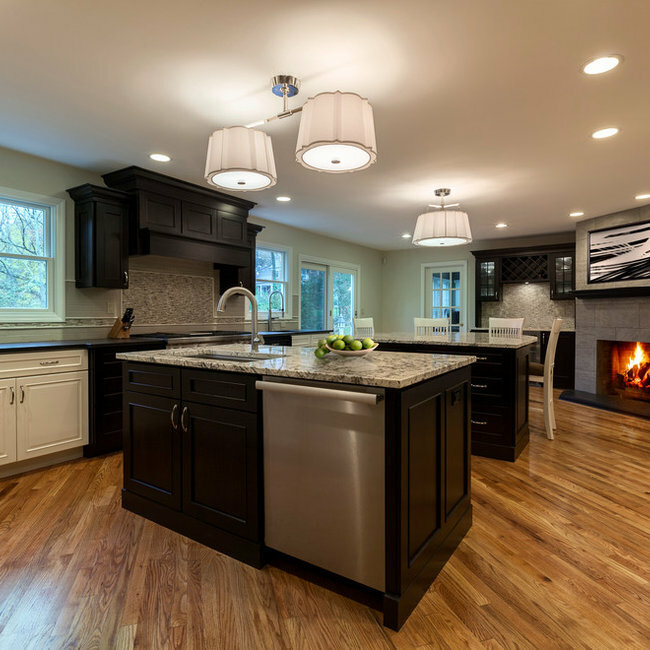 14 photos Functional layout and beautiful finishes make this kitchen a dream come true. Placing the sink on an angled corner of the island between the range and refrigerator creates an easy work triangle while the large island allows for roomy prep space. Two pantries, one near the range and one near the refrigerator, give plenty of storage for dry goods and cookware. 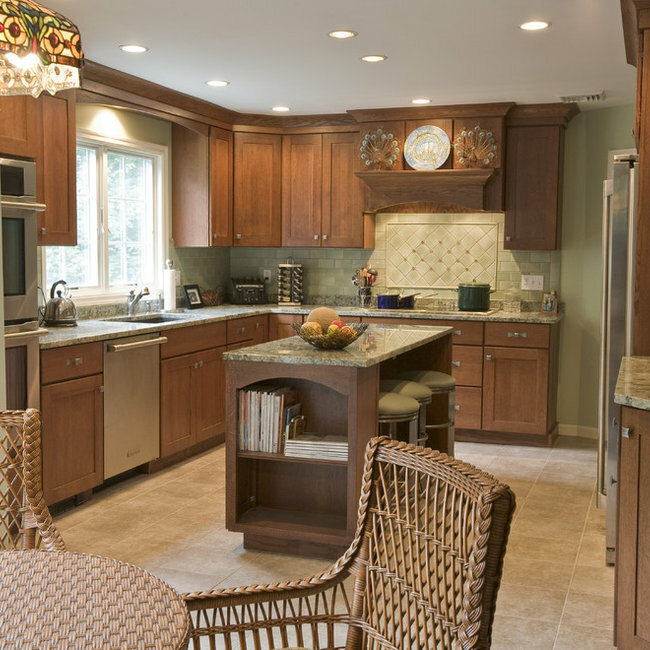 Guests are kept out of the cooks way by placing ample seating and the full service bar on the other side of the island. Open views through the breakfast room to the beautiful back yard and through large openings to the adjoining family room and formal dining room make this already spacious kitchen feel even larger. 14 photos This small house needed a major kitchen upgrade, but one that would do double-duty for the homeowner. Without the square footage in the home for a true laundry room, the stacked washer and dryer had been crammed into a narrow hall adjoining the kitchen. Opening up the two spaces to each other meant a more spacious kitchen, but it also meant that the laundry machines needed to be housed and hidden within the kitchen. To make the space work for both purposes, the stacked washer and dryer are concealed behind cabinet doors but are near the bar-height table. The table can now serve as both a dining area and a place for folding when needed. However, the best thing about this remodel is that all of this function is not to the detriment of style. Gorgeous beaded-inset cabinetry in a rustic, glazed finish is just as warm and inviting as the newly re-faced fireplace. 13 photos This luxurious kitchen and house addition, designed by Barry Miller of Simply Baths & Showcase Kitchens is outfitted with loads of amenities. From the built-in steamer, to the lift-up mixer cabinet, from the pull-out spice racks, to the warming drawer, this kitchen has loads of options that any home chef would love. 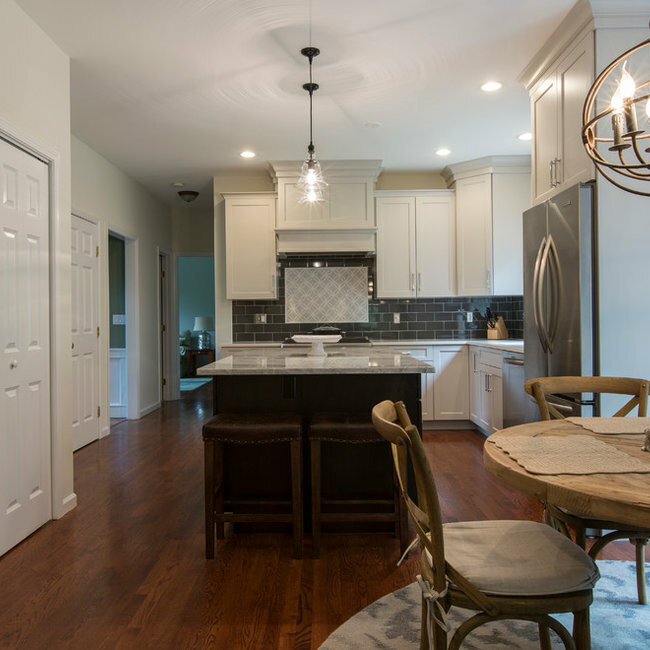 However, to make the cooking and prep process even more enjoyable, this spacious kitchen invites family and guests to stay or even join in on the fun. 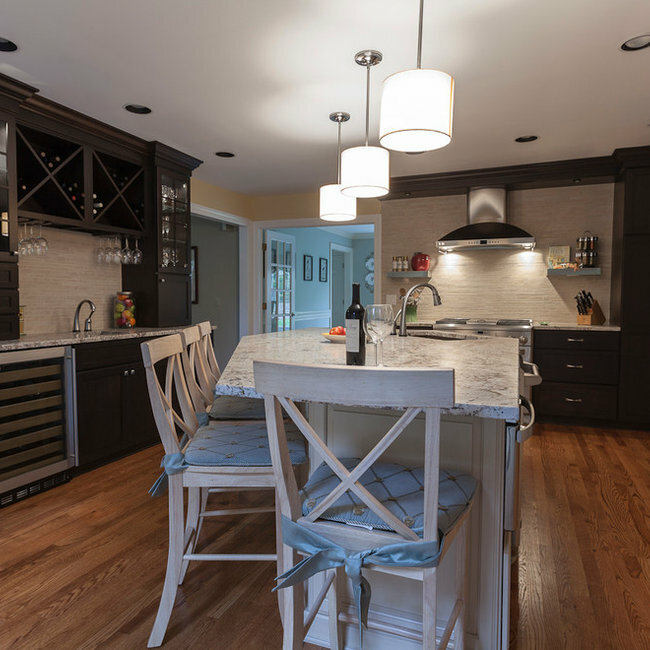 The large island is the perfect spot for guests to hang and chit-chat while all the cooking is happening or with multiple prep sinks and counters they can lend a hand without being in the way. For the ultimate finishing touch on the space, a TV lifts out of the island counter both entertaining and wowing guests. Finally, all these luxuries come wrapped in a beautiful package: dual-finished cabinetry in maple and cherry, a travertine backsplash with gold glass mosaic accents, and rippling gold granite countertops. 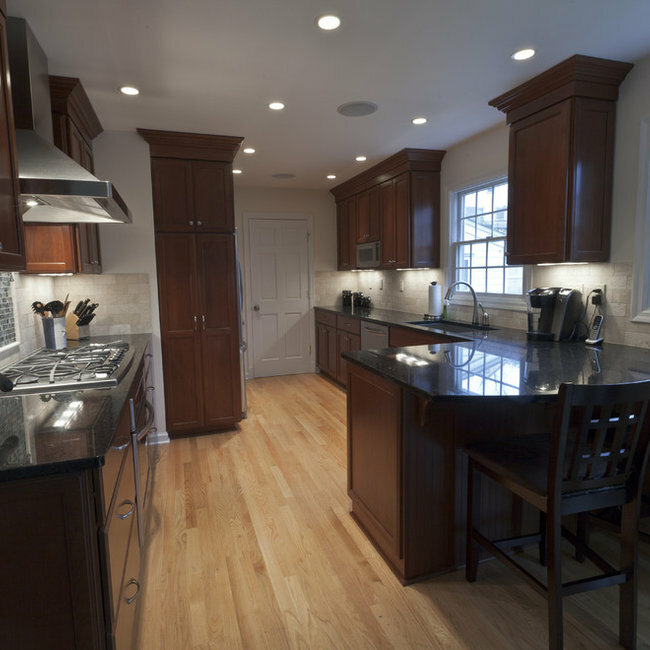 8 photos This CT kitchen was remodeled with one purpose in mind: to add value to the home for quick resale. 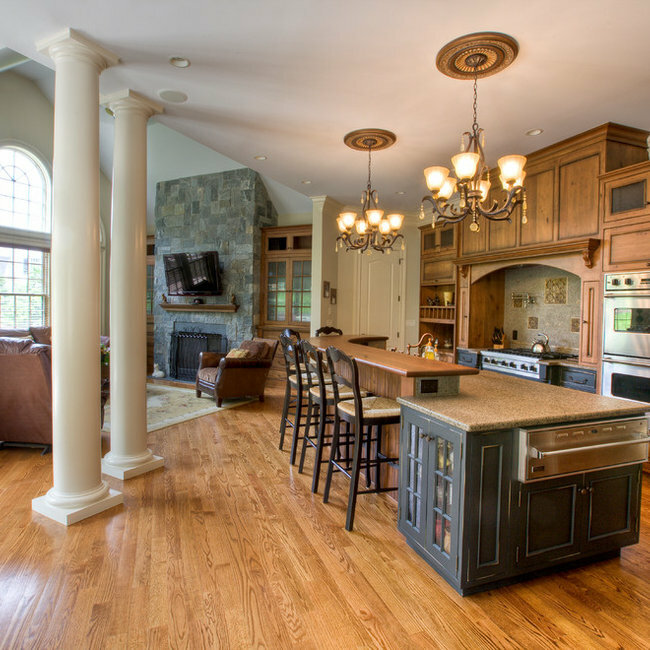 Different than remodeling for the specific tastes and lifestyle of unique and individual homeowner or family, remodeling for resale means keeping the finishes neutral and keeping the financial investment low. 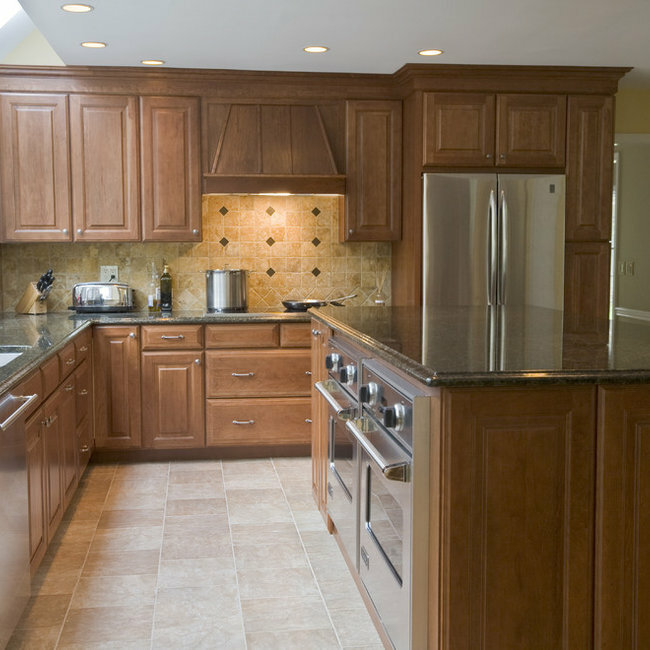 To achieve that end, a medium brown cabinet finish is paired with a warm beige backsplash. The porcelain floor tile is also neutral allowing the dark Ubatuba granite to create all the contrast in the space. Ubatuba is one of the most affordable and readily available natural stones on the market. 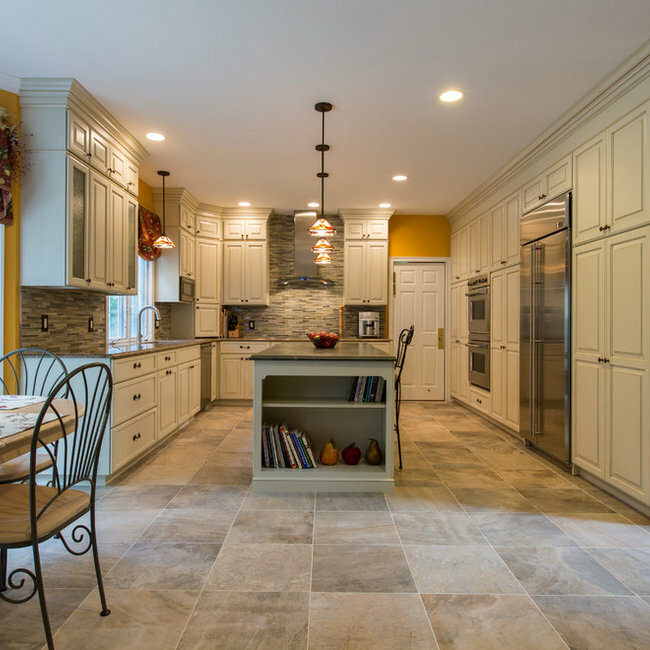 This makes it a perfect option for homeowners looking to update on a budget while still bringing the value of natural stone to the kitchen. However, it's still a gorgeous stone, with a dark green undertone accentuated by coppery flecks. 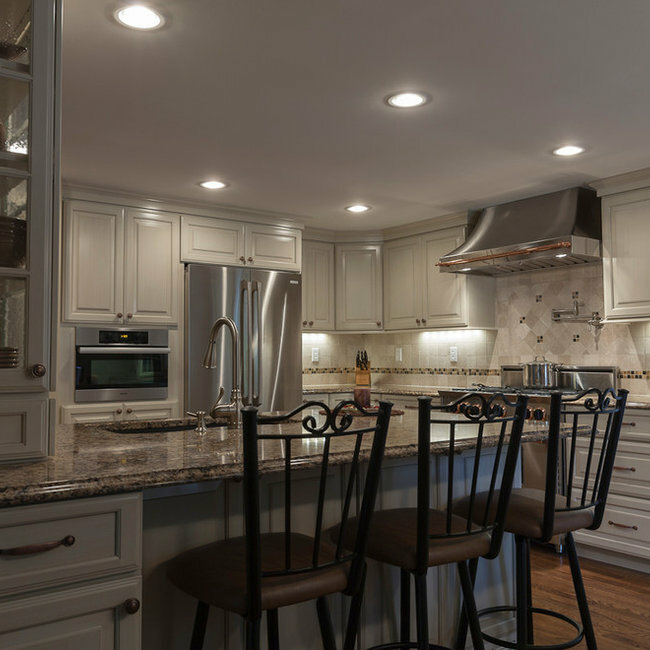 The combination of all these parts creates a beautiful kitchen that nearly any buyer would feel at home in, evidenced by the quick sale of this property. The purchaser's comment: "I want that kitchen." 7 photos This long narrow kitchen needed sleek new style to better compliment its young new homeowners. However, each spouse came to the design process with very different opinions of what to do with the space. 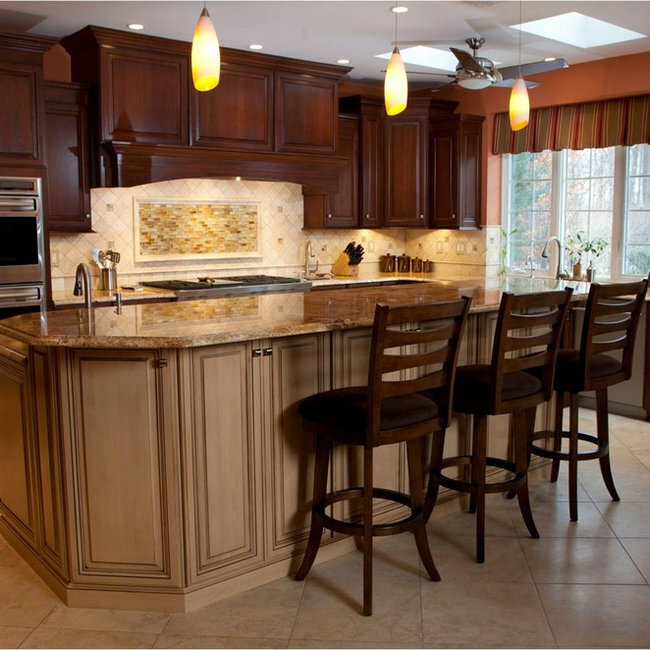 He wanted warm cherry cabinetry with rich gold granite and traditional detailing while she wanted calmer, cooler tones with modern edges and accents. Meeting somewhere in the middle, the new kitchen boasts the cherry cabinetry he loves with a cool toned ivory backsplash for her. The surprising element of this room is how husband and wife came together to select Volga Blue countertops: a striking dark granite with blue iridescent flecks. The stone is enough of a statement piece for him while still being modern and edgy for her. The final product of this beautiful collaboration is a beautiful, transitional kitchen they'll both love for many years to come.